Hard to say....I would say IG over a single Beyonder. A single Beyonder was shown destroying a single universe and all the uber cosmic beings in that universe, which is roughly equivalent to the Infinity Gauntlet Thanos showing. So they are at about the same level, above Eternity. The Phoenix Force has avatars across the multiverse possessing its power. The sum total of that power is probably greater than a single Beyonder or the Infinity Gauntlet, but any given avatar is lower than a single Beyonder or the Infinity Gauntlet. We saw Doom with the power of multiple Beyonders defeat Cyclops with the Phoenix Force, but again, that was the power of multiple Beyonders. Korvac is upper skyfather level and the least powerful here. What about single Byeonder, you said that the full power of Pheonix Force might be above single Beyonder and Infinity Gauntlet? What about Beyonder vs. Infinity Gauntlet? And what about heart of tthe universe-is that even cannon anymore? And again what about heart of the universe vs. 3 Beyonders or vs. Pheonix Force-all at full power? Or Heart of the universe vs. Phoenix Force and one Beyonder-all at full power? Or heart of the universe vs. 3 Beyonders-all at full power? Or heart of the universe vs. 3 Beyonders and Phoenix Force-all at full power? Phoenix Force with full power has less power than the power of multiple Beyonders that Dr. Doom had? I didn't say the Cyclops had the full power of the Phoenix Force. I don't know how much he had, but whatever it was, it was less than the power of multiple Beyonders. I'd guess even the full Phoenix Force though is less powerful than multiple Beyonders. They appeared pretty equivalent in their showings against respective opponents. The comics have been a bit contradictory though and in some depictions, the Infinity Gauntlet has shown the limitation that it only works in one particular universe. The Beyonders don't have that limitation. On the other hand, the Beyonders have a weakness to time manipulation and the Infinity Gauntlet has the time gem. And again what about heart of the universe vs. 3 Beyonders or vs. Pheonix Force-all at full power? 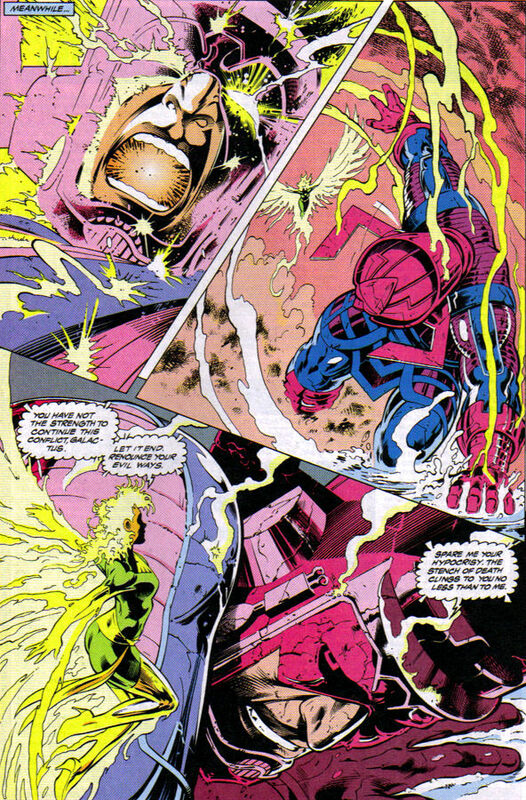 Or Heart of the universe vs. Phoenix Force and one Beyonder-all at full power? I think it was, but I can't find confirmation anywhere. It was assumed. The story doesn't make as much sense without that assumption. The Molecule Man contained the power like a battery and Doom was using it until Reed broke that connection. Thanos with infinity gauntlet did not destroy any universe. False, full power Phoenix Force was deemed at Galactus level only and is at nowhere near IG or Beyonder level. Doom with all that power can't take down an IG wielding Black Panther or a Phoenix powered Cyclops without effort. He requested help from Maestro, Goblyn Queen etc, where Thanos was beating down high end cosmics and just willing half of the universe dead. No telepathy, precognition feats etc. Isn't your example of what Thanos was doing with the Gauntlet pointing out that taking down an Infinite Gauntlet wielder is going to be difficult no matter what? 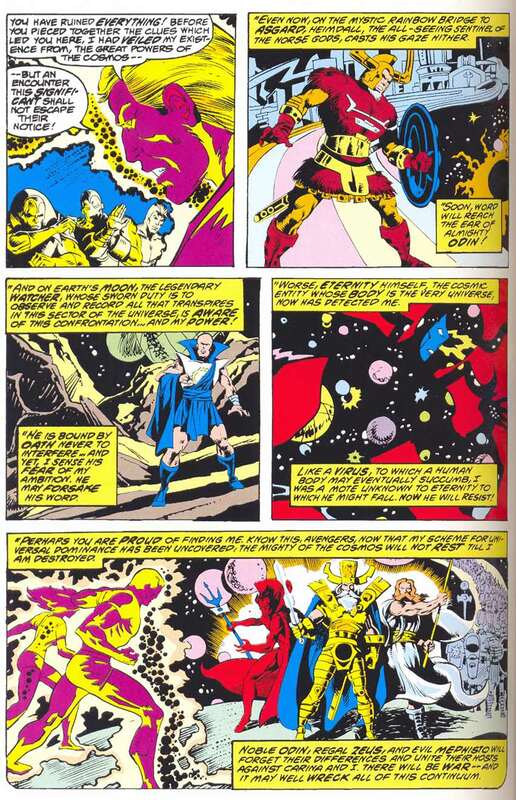 When Adam Warlock had the Infinity Gauntlet, he made a point that it was going to be difficult for even the Living Tribunal to take it away from him. It took three Beyonders to down the Living Tribunal. I don't know the power of how many Beyonders that Doom/Molecule Man had and I think the comic left that vague on purpose, but it just points to how potent the Infinite Gauntlet and the Phoenix Force are. Ummm, Korvac had the potential to reach that level. Both early stories involving the Living Tribunal saying he could grow to be more powerful and later stories with Beyonder Doom containing instead of eliminating him and his awakening being big news that would require his personal attention suggest he can be that level but wasn't ever yet that powerful. I'm a little confused here where was the GL Battery considered on par with the IG? Surely not because it was one the items collected during the Avengers/JLA cross over. Well they have been rather consistent with the gauntlet having power over a single universe. Never was it stated or intended to be multi-versal. Each universe has its own IG which can't be used in other universes. The only time the IG was multi-versal was when it was a single being before it killed itself and put the infinity gems in each universe. Of course this will change when another writer will throw all of this out the window and come up with something else that will supersede all of this. Really, he's about equal to the Silver Surfer. This again? Korvac was going to destroy the combined Avengers/Guardians of the Galaxy teams. He talked of battling Odin, Zeus, Mephisto and their entire armies, he talked of overthrowing Eternity and taking over the universe. And you continue to say Korvac is no more powerful than the Silver Surfer?!? Okay, who wins this fight? Is it your opinion that the Silver Surfer can effortlessly kill them all?